The developers at Treasure sure know their way around shooters. With classics like Gunstar Heroes under their belt and the launch of Sin and Punishment: Star Successor for the Wii, Treasure has been giving gamers around the world a serious taste of action for years. Shooter fans are in luck, because the developers aren't stopping there -- Bangai-O HD: Missile Fury is heading to Xbox Live Arcade this November. A sequel of sorts to Bangai-O Spirits for the Nintendo DS, Missile Fury is meant to represent the true Bangai-O experience by offering players a wealth of levels and some of the most action-packed challenges around. I had the opportunity to play a pre-alpha version of Bangai-O HD a few weeks ago and, despite suffering death on more than one occasion, I had a great time with the game. It should be noted that the build I was shown was very early and there's a lot that could change by the time the final game is released. 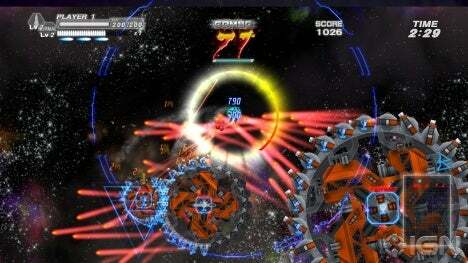 But at its core, Bangai-O HD: Missile Fury is a 2D shooter that puts players in control of a heavily armed robot. By using the left stick to move and the right stick to shoot, players will need to survive an absolutely insane amount of projectiles in order to clear the game's 100 or so levels. Even in its early form, Missile Fury seems to have it all. The game comes equipped with a full level editor which will enable gamers to share their creations online with friends. There will also be the standard addition of leaderboards and more. There isn't any multiplayer to speak of, but there looks to be plenty of content to keep people busy. Most levels have targets that need to be destroyed, which are marked on the mini-map in the corner of the screen. In order to get to those targets, some thought needs to go into solving in-game puzzles. Gates will often block the player's path, which need to be opened by triggering an explosive fuse, for example. This might sound like an easy puzzle to solve, but with hundreds of missiles on screen, there's a lot of action to keep track of. Don't worry though; your trusty war machine has a few tricks up its cybernetic sleeve. There are three different weapon types that can be picked up during play: Bound, Break and Homing. Bound power-ups give your mech a beautiful collection of lasers, which bounce off of walls and down corridors with devastating results. Break missiles chew through enemy fire like a hot knife through butter, and Homing missiles (as you might have guessed) track nearby enemies. I originally assumed that Break missiles would always be the best choice, as their potency against incoming fire is absolutely critical in a pinch. But after playing a level that was set in very tight passages, I soon came to appreciate the Bound power-up as well. The mech can also use a short-range dash to smash enemies, but this is only useful in close quarters. The most devastating technique the mech can employ is a super move which fills the entire screen with missiles (or lasers). This technique needs to be charged and players can't move during this charging phase, but pulling off the attack is immensely satisfying. Bangai-O controls well and seems like a lot of fun, from what I've seen so far. I love how much happens on screen at one time and I'm equally taken with how much giant fruit needs to be picked up to keep alive (Fruit refills your health meter, obviously!). Shooter fans should keep Bangai-O HD: Missile Fury on their radar, because this action-packed downloaded has some serious potential. plus that last pic is full of win! ahh the days of the DS game. Bangai-O HD: Missile Fury, the Xbox Live Arcade update to the Treasure series that gets a surprising amount of attention, will not be coming out this year as originally planned. Don’t worry, there’s a happy ending to this story. 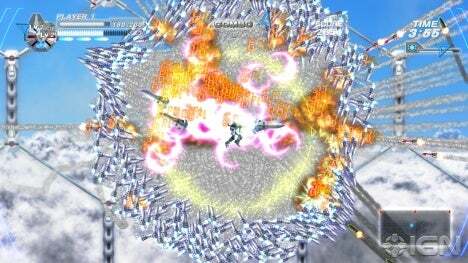 D3 Publisher, the folks bringing Treasure’s missile barrage of a shooter to XBLA, says that the Bangai-O high-definition sequel is being delayed to allow the developer time to add competitive and cooperative multiplayer to the title. That means a delay to “autumn 2011″, where every other game seems to be heading these days. If you like missiles and explosions, but don’t know what a Bangai-O is, watch these videos of the XBLA version in action. Then cool your jets until springtime, new Treasure fan. Delayed til 2011. At least they're adding in a bit more though. How do you guys think Multiplayer would work? I don't know, but all I know is that it will be AWESOME. How do you guys think Multiplayer would work? they'll probably do a few modes. One would be similar in style to tetris, where you both compete for the fastest times etc. If there was one where you would v.s each other directly as enemies (the most exciting one) it would definitely be a massive map where you battle it out - missiles all in yo face experience. How large is the download? I don't have a lot left and I really want to give this a shot.